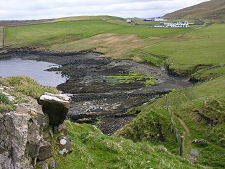 The road across the north end of the Trotternish Peninsula emerges on its west coast at the small settlement of Duntulm. Beyond the settlement a rocky promontory is the location of the fragmentary remains of Duntulm Castle, offering a superb defensive location guarded on three sides by sheer cliffs. A well made path leads along the coast to Duntulm Castle from a bend in the main road a few hundred yards to its south east. A sign on the gate at the start of the path notes that the castle is structurally unstable and that "for your safety you are advised not to proceed beyond the castle fence line". A further sign at the castle end of the path reinforces the message. 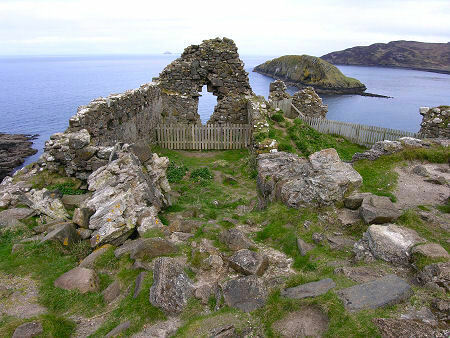 Should you choose to explore the castle despite these warnings, do so with great care: there are long drops surrounding the ruin, and part of the structure have collapsed into the sea in the relatively recent past. As you approach the castle you find that its builders supplemented the natural defences on three sides by digging a ditch across the landwards side. Just beyond the ditch is a cairn commemorating the MacArthurs, the hereditary pipers to the MacDonalds. 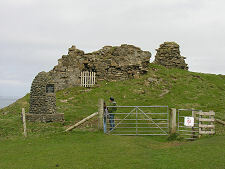 The promontory beyond the ditch is occupied by a series of fragments of stone walls that represent a number of different elements of the castle. The highest part of the site was once home to a keep, under which you can still glimpse part of a barrel vaulted cellar. 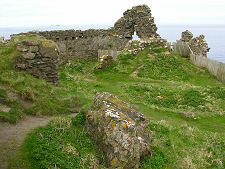 The north west corner of the promontory is occupied by the remains of what seems to have been a great hall. Elsewhere are tantalising pieces of curtain wall or other buildings. 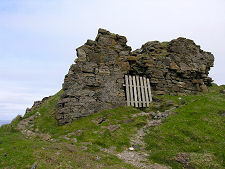 When MacGibbon and Ross visited Duntulm in the 1880s while researching The Castellated and Domestic Architecture of Scotland they recorded ruins that were much more substantial than those you find today, and a photograph taken at about the same time shows parts of the keep to be standing to several storeys high. 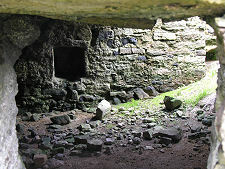 It seems that over the past century some of the castle's stonework has been reused for local building projects, while other parts have been eroded away. One tower simply collapsed into the sea in 1990. 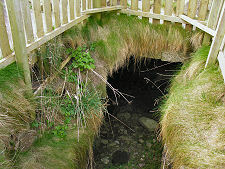 Duntulm is believed to have been first fortified in the Iron Age, and the site continues to be associated with the name Dùn Dhaibhidh or "David's Fort". 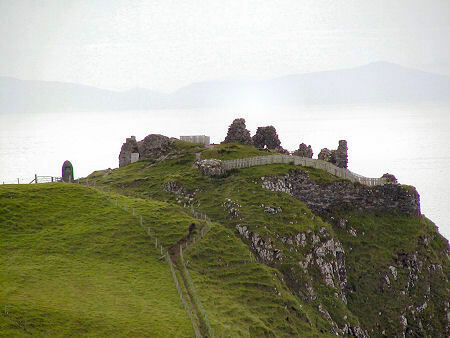 Later in life it was fortified by the Norse, and subsequently by their successors, the MacLeods of Skye. It would have been while it was under the MacLeod's tenure that James V visited the castle in 1540, where he was impressed by its strength and the quality of the hospitality on offer. 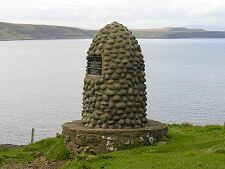 By the early 1600s, Trotternish was under the control of the MacLeod's rivals on Skye, the MacDonalds of Sleat. They appear to have made a number of improvements to the castle and it is possible that much of the structure recorded in the late 1800s, apart from the keep, dated back to this period. 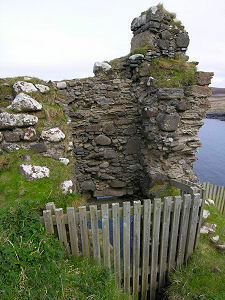 The MacDonalds abandoned the castle in about 1730 in favour of nearby Monkstadt House and then Armadale Castle in Sleat. Some say this was after a nursemaid accidentally dropped the baby son of the clan chief from a castle window above the cliffs. The ghost of the nursemaid, killed in retribution, is still said to wander the ruins. She is apparently kept company by the ghost of Hugh MacDonald, who plotted against the rightful clan chief in the 1600s, and who was starved to death in the dungeon at Duntulm.